Younis Khan cracked an unbeaten double-century and Asad Shafiq made his maiden hundred as Pakistan closed in on victory in the first Test against Bangladesh here on Sunday. Younis smashed a solid 200 not out and Shafiq an impressive 104 as Pakistan posted 594-5 declared in their first innings in reply to Bangladesh’s 135 in Chittagong. The hosts faltered against spin before reaching 134-4 in their second innings at stumps on the third day, with debutant Mohammed Nazimuddin and Shakib Al Hasan each unbeaten on 41. Bangladesh still trail by 325 runs with six wickets in hand. Off-spinner Mohammad Hafeez, who was pressed into the attack after only five overs, struck with his fifth delivery after the tea break when he bowled opener Tamim Iqbal for 15. Bangladesh lost three wickets in the space of six runs after Nazimuddin and Shahriar Nafees added 50 for the second wicket, with off-spinner Saeed Ajmal, left-arm spinner Abdur Rehman and paceman Aizaz Cheema doing the damage. Nafees made 28 and Nasir Hossain three while Mohammad Ashraful failed to open his account before Nazimuddin and Shakib added 54 for the unbroken fifth-stand stand to steady the innings. Pakistan declared their innings in the afternoon session immediately after Younis turned left-arm spinner Shakib to square-leg for two runs to complete his double-century, his third score of 200 or more in 72 Tests. Younis dominated the Bangladeshi attack with rich strokeplay, hitting three sixes and 18 fours in his 290-ball knock. Bangladesh continued to struggle for success as they took more than a session to get their lone wicket, but not before Younis and Shafiq had put on 259 for the fifth wicket. Left-arm spinner Elias Sunny broke the stand when he dismissed Shafiq, who cracked two sixes and nine fours in his 235-ball innings before being caught by Nafees at long-off while going for a big shot. 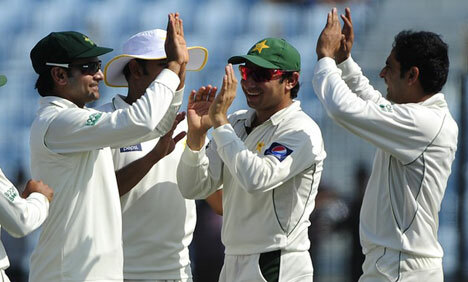 Pakistan added 179 runs after resuming at 415-4. Younis, 96 overnight, reached his 19th Test hundred in the opening over when he flicked paceman Shahadat Hossain for a four. He was later caught off a Rubel Hossain no-ball by Sunny at deep square-leg on 138. Shahadat took one wicket each.